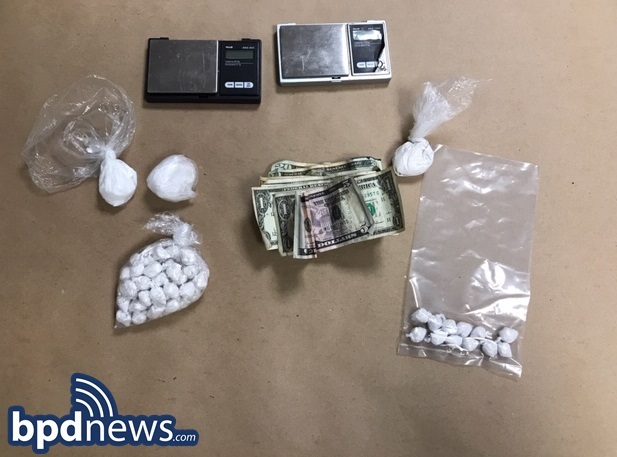 At about 3:30 PM on Thursday March 28, 2019, members of the District D-14 (Brighton) Drug Control Unit arrested Jose Arias, 31, of Jamaica Plain, on drug related charges during an investigation in the area of 354 Market Street in Brighton. Officers stopped a motor vehicle which was being operated by the suspect after observing a street level drug transaction in the area of Oak Square. Officers removed the suspect and placed him in custody without incident after recovering 118 bags of cocaine with a total weight of 266 grams from suspect’s jacket pocket and from inside the vehicle. The suspect will appear in Brighton District Court on charges of Trafficking Class B Drugs. After several months of investigations, officers observed Dreshaun Johnson enter a motor vehicle in the area of 317 Wood Avenue and conducted a traffic stop of that motor vehicle in the area of 164 Wood Avenue. Officers removed Dreshaun Johnson from the motor vehicle and located several plastic baggies of illegal narcotics on his person. Officers also conducted a search warrant of Dreshaun Johnson’s residence and seized the following items: 1 Smith and Wesson revolver, several rounds of ammunition, and other drug paraphernalia. Dreshaun Johnson was charged with Unlawful Possession of a Firearm, Unlawful Possession of Ammunition, Trafficking; Class A, Drugs (Fentanyl), and Distribution of Class B, Drugs (Cocaine). He will be arraigned in West Roxbury District Court. At about 10:00 AM on Monday March 25, 2019, members of the District E-18 (Hyde Park) Drug Control Unit arrested Roberto Polanco, 37, of Mattapan, on drug trafficking charges during an investigation in the area of Ruxton Street in Mattapan. Officers had located the suspect and were attempting to execute a search warrant for his person when he fled on foot through several neighborhood backyards. Officers pursued and were soon able to place the suspect in custody in the area of 14 Rockingham Road. 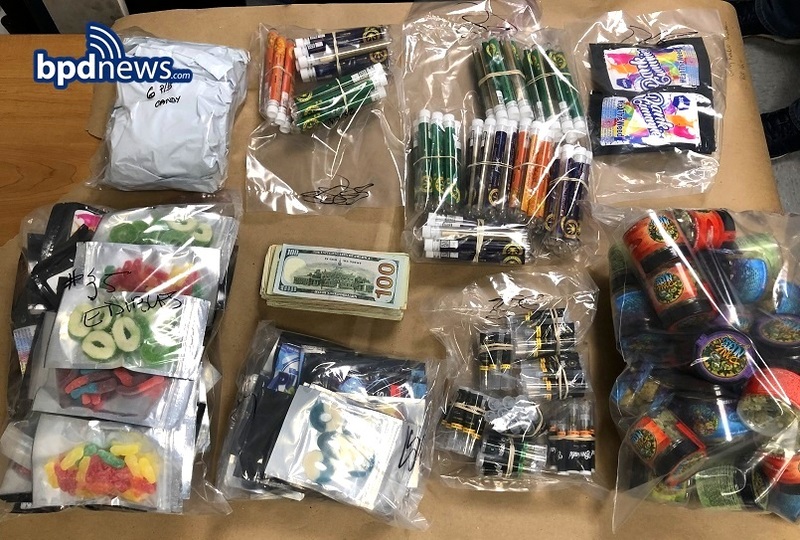 Officers then executed a search warrant at the suspect’s residence which led to the recovery of 267 grams of heroin, 133 grams of fentynal, $5,671 in U.S. Currency along with other evidence consistent with the packaging and selling of illegal drugs. The suspect will appear in Dorchester District Court on charges of Trafficking Class A Drugs (2 Counts). 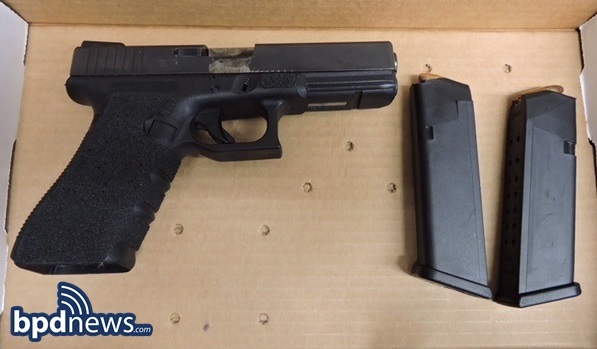 At about 6:25 PM on Sunday March 10, 2019, officers assigned to the District E-13 (Jamaica Plain) Drug Control Unit arrested two suspects on firearm and drug related charges during an investigation in the area of West Main Street and Morton Street in Dorchester. Officers performed a traffic stop after observing a street level drug transaction at which time they arrested the rear seat passenger, Wilbert Soto, 21, of Jamaica Plain, without incident. Officers then recovered various edibles, THC and BHO cartridges, loose marijuana and cash from inside the vehicle near where the suspect had been seated. Officers continued their investigation which led to the recovery of a loaded .380 caliber Lorcin handgun from inside the trunk of the vehicle. Officers then arrested the operator, Luis Otero, 21, of Jamaica Plain, who was placed in custody without incident. Both suspects will appear in Dorchester District Court for arraignment. Wilbert Soto will be charged with Distribution of Class D Drugs and Possession with Intent to Distribute Class C and D Drugs. Luis Otero will be charged with Unlawful Possession of a Firearm, Unlawful Possession of Ammunition and Possession with Intent to Distribute Class C and D Drugs. 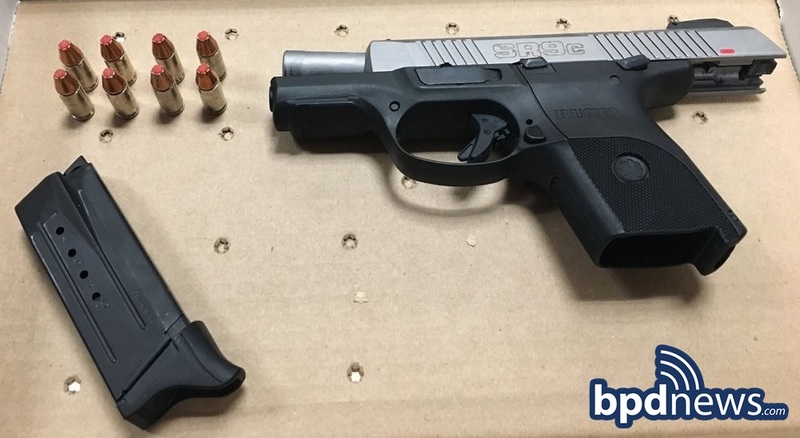 SAFER BOSTON: At about 5:00 PM on Tuesday March 5, 2019, members of the District B-3 (Mattapan) Drug Control Unit arrested Dana Sams, 42, of Dorchester on numerous firearm and drug related charges during an investigation in Dorchester. Officers executed a search warrant for both the suspect and his vehicle during a traffic stop in the area of 236 Seaver Street in Roxbury which resulted in the recovery of several bags of heroin, powdered cocaine and crack cocaine along with $1,903 in U.S. Currency. 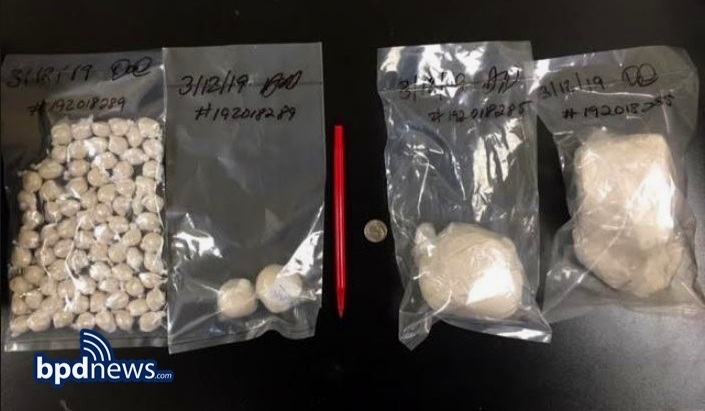 Officers later determined the total approximate weight of the drugs recovered to be 20 grams of heroin, 4 grams of powdered cocaine and 24 grams of crack cocaine. Officers simultaneously executed a search warrant at the suspect’s residence on Florida Street in Dorchester which resulted in the recovery of a .22 caliber scoped rifle, a 9mm Mac-11 machine pistol, a 9mm handgun, a .380 caliber handgun, numerous rounds of various calibers of ammunition along with seven assorted extended magazines. The suspect will appear in Dorchester District Court on charges of Unlawful Possession of a Firearm (4 Counts), Unlawful Possession of Ammunition, Possession of a Large Capacity Feeding Device (7 Counts) and Trafficking Class A and B Drugs. KEEPING BOSTON SAFE: At about 10:48 AM on Wednesday, December 19, 2018, members of the District C-11 Drug Control Unit executed a search warrant in the area of the 500 block of Talbot Ave in Dorchester. As a result of the search, officers were able to seize 2 plastic bags containing a Class B Drug (Crack Cocaine), a loaded Glock 22 firearm, a ballistic bullet resistant vest, over 100 rounds of live ammunition and over $700 in counterfeit US Currency. Additionally, officers arrested Matthew Lyden, 40, of Dorchester, who had an outstanding default warrant out of Woburn District Court for Possession of a Class B Drug and Unlicensed Operation of Motor Vehicle, and charged him with Possession of a Class B Drug (Crack Cocaine). 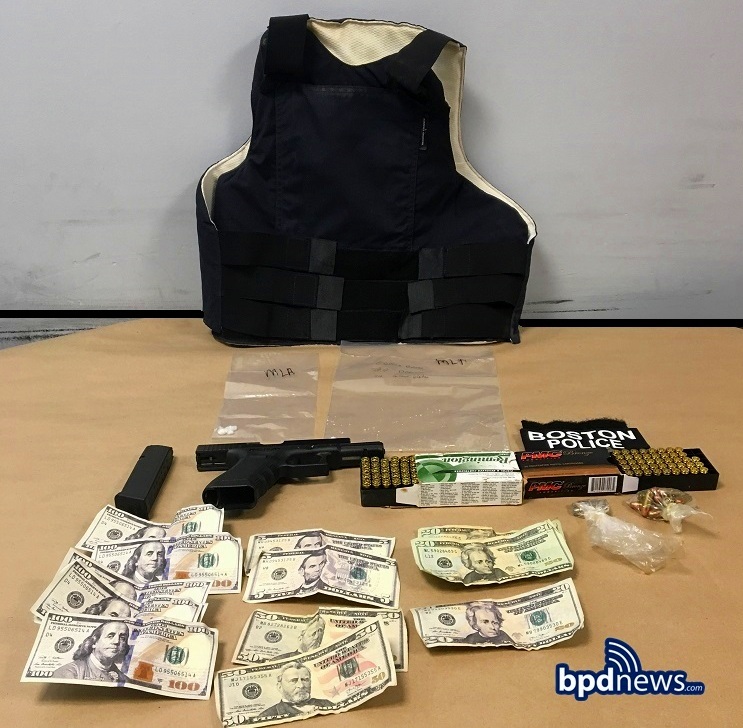 Officers also arrested Edwin Powell, 45, of Dorchester and charged him with the Unlawful Possession of a Firearm, Unlawful Possession of Ammunition, Unlawful Possession of a High Capacity Feeding Device and Possession with Intent to Distribute a Class B Drug (Crack Cocaine). Keeping Boston Safe: At about 11:32 AM on Wednesday December 12, 2018, members of the District C-11 (Dorchester) Drug Control Unit recovered a loaded firearm, drugs and cash after executing a search warrant as part of an investigation in the area of 27 Gayland Street in Dorchester. As a result of their search, officers located and seized a loaded .25 caliber Raven handgun, 2 large rocks of crack cocaine with an approximate weight of 12 grams, 2 small bags of crack cocaine, 1 medium bag of crack cocaine, 1 medium bag of heroin and $10,729.00 in U.S. Currency. 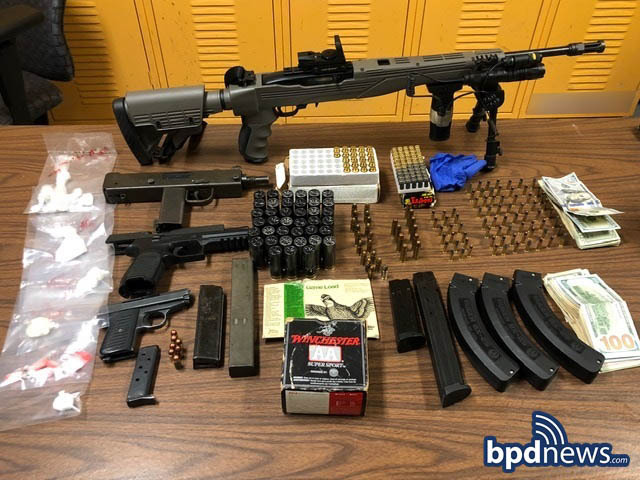 Officers then arrested the target of their investigation, Luis Otero, 28, of Dorchester, without incident on charges of Unlawful Possession of a Firearm, Unlawful Possession of Ammunition and Possession with Intent to Distribute Class A and B Drugs. While on scene, officers also arrested Alex Archambault, 34, of Leominster on charges of Possession of Class B Drugs. Both suspects will be arraigned in Dorchester District Court. Keeping Boston Safe: At about 5:10 AM on Monday November 19, 2018, members of the District D-14 Drug Control Unit (Brighton) assisted by the BPD SWAT Team executed a search warrant as part of an investigation in the area of 81 Faneuil Street in Brighton. As a result, officers located and seized a loaded .32 caliber Iver Johnson revolver, a ballistic vest in a tactical carrier, along with several bags of marijuana and $485.00 in U.S. Currency. Officers then arrested the target of their investigation, Cesar Crespo, 20, of Brighton, placing him in custody on scene without incident. The suspect will appear in Brighton District Court on charges of Unlawful Possession of a Firearm, Unlawful Possession of Ammunition and Distribution with Intent to Distribute Class D Drugs. KEEPING BOSTON SAFE: At about 8:10 AM, on Thursday, November 15, 2018, members of the District B-3 Drug Control Unit (Mattapan) arrested Jesus Mojica, 33, of Mattapan, after executing a search warrant in the area of 1317 Blue Hill Avenue. As a result of their investigation, officers located and seized a loaded 9mm Sig Sauer handgun, a loaded .22 caliber North American revolver, $4,029.00 in U.S. Currency along with several bags of marijuana and other drug paraphernalia. The suspect will appear in Dorchester District Court on charges of Unlawful Possession of a Firearm (2 Counts), Unlawful Possession of Ammunition (2 Counts), Possession with Intent to Distribute Class D Drugs. At about 12:00PM on Thursday November 15, 2018, members of the District C-6 Drug Control Unit (South Boston) and officers assigned to District C-6 (South Boston) executed a search warrant in the area of 30 Orton Marotta Way. As a result of the search warrant, officers located and seized two scales, $900 US Currency, and numerous bags of Fentanyl with an approximate total weight of 136 grams. Wilden D. Suazo, 30 of Boston and Cheryl Higgins, 54 Boston were placed under arrest and charged with Trafficking Class A Drugs (Fentanyl). Both will be arraigned in South Boston District Court. Sergeant Detective Dennis Cogavin and Police Officers Daren Bradshaw, Patrick Flaherty and Charles Moore, assigned to the District E-13 Drug Control Unit, recently arrested an armed suspect while defusing a potentially violent confrontation in the area of 1990 Columbus Avenue in Roxbury. The officers were conducting a drug investigation in the area when they observed a male suspect armed with two knives chasing a male victim on the opposite side of the street. The officers immediately responded, sprinting across the street to intervene. Officers ordered the suspect to drop the weapons and placed him in custody without further incident after he complied. The suspect was later arraigned in West Roxbury District Court on numerous charges including Assault by Means of a Dangerous Weapon. Officers Bradshaw, Moore, Flaherty and Sergeant Detective Cogavin are commended for their professionalism in the face of an armed suspect and courage while preventing a possibly deadly street encounter. These officers managed to successfully place an armed individual under arrest during an extremely volatile incident without harm to any parties involved, officers or bystanders. For their efforts they are each awarded a Commissioner’s Commendation.